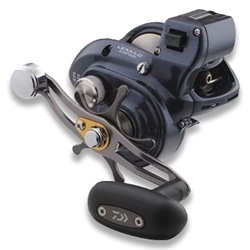 With its sleek, tight construction, the Daiwa Lexa Line Counter Reel is not like most other trolling reels. Its frame is decidedly low-profile, suggesting comfortable handling, yet it carries a high line capacity and an overbuilt drag system. Saltwater and freshwater tough, this reel is all about handling heavy fish. The Daiwa Lexa LC balances nicely on any trolling rod, and features a sturdy aluminum (not graphite) frame and gear side plate for extra strength without the extra weight. Its top-mounted mechanical line counter reads in feet, offering repeatable precision for keeping your lure in the strike zone on each pass. The smooth 7-bearing system includes Daiwa's Infinite Dual Anti-Reverse to ensure maximum hooksetting power; a convenient spool click provides a buffer on the hardest strikes and alerts you to activity. Once the fish is on, the Ultimate Tournament carbon drag (UTD) delivers up to an amazing 22 lbs. of max drag, to get even hard-slashing salmon to the net quickly. 100mm handle with oversized cranking knob for maximum leverage. Whether you troll the Great Lakes or coastal waters, the Daiwa Lexa Line Counter Reel gives you a fighting chance, no matter what you hook into!